15/03/19 — Documents — I have changed the menu “Books / Mags” to the name “Documents” now as that allows for all sorts of other media, such as leaflets that I can upload there. Also, I have now uploaded some new software which I recently acquired. All Zen related. I now have copies of Zen Toolkit and Zen Debug by Sharpsoft. I have uploaded these to the usual Downloads area under the Programming folder. I also have manuals for these in the Documents area. I have also uploaded the MZ-80K version of Zen just in case it’s useful and I also have a copy of something called Zen Plus which I have yet to find out the details of. Finally, I also acquired a copy of the installation leaflet for the MZ-80AEU Expansion Unit, this has also been added to the Documents area. 24/02/19 — Utilities — Just uploaded a copy of Supercopy which is a very useful utility for managing disks and running programs from disk. Please find it in the Downloads section under the Utilities folder. 18/11/18 — Programming — I recently received a tape of Apollo software’s program Slave V1.1A as published by Kuma. I’ve uploaded it to the Programming folder of my Downloads section. I believe it is supposed to provide the beginner assembly language programmer a safe environment in which to learn the basics of assembly language programming. I have yet to find a manual for it though. Once I have some instructions then I will upload these too. 05/11/18 — Applications — I have finally managed to upload a copy of the Sharp “Applications” tape. I’m not sure where this tape comes from as it is not mentioned in the Software Manual which comes with the MZ-80A but it is an official Sharp cassette so is worth uploading. Please find it in the Downloads section under the Software Pack folder. 02/10/18 — Programming — I have just uploaded a copy of Sharpsoft’s Fig-Forth to the Downloads section under the Programming folder. I also have the Fig-Forth Editor tape but yet to understand how it works. Will update once I know this and can preserve in digital form. 26/08/18 — Manuals — I have updated the Programming Manuals section. The design was left over from when you could pick and choose MZFs and WAVs and PDFs from the same page but once I moved all MZFs to a single Download area all that was left were PDFs so it wasn’t looking very good anymore. Now the format more closely matches the Books/Mags section. More manuals will be added as I find them. 25/08/18 — Books / Mags — A few months ago an MZ fan from Germany (Joshua) contacted me with a couple of games that weren’t on the site. A Chess game and another Defender clone. I’ve added these to my Downloads section under Games/Machine Code. Both start with “Deutsche” as their name so they’re easy to find. The Chess game even has a scanned manual. 21/08/18 — Books / Mags — I recently came across the book “Starting Pascal on the Sharp Microcomputer” published by Sharpsoft. You can find it in the Books / Mags section. It’s a useful tutorial on Pascal but it is also specific to Sharp’s SP-4015 interpreter. 20/08/18 — Programming — I have just uploaded a copy of Fortran (Knight’s Wee Fortan, to be precise). Please find it in the Programming folder in my Downloads section. 19/08/18 — Downloads — I recently uploaded a new game from Japan called “CRT Chaser”. It is for the MZ-1200 but works acceptably on the MZ-80A if you use SP-5030. It would work better, naturally, with the Japanese character ROM (easily patchable on the emulator). I have also just uploaded “Connect 4” for SA-5510. This was helpfully typed in by Minesnake author Joachim Froholt from the original “Peeking and Pokeing the MZ-80A” book by G. P. Ridley. I plan on writing a machine code tutorial around this game where I will convert it to assembly language in a step-by-step guide. Find both games in the Downloads section. 15/08/18 — Downloads — I have uploaded a copy of the complete Neoncluster archive to my Downloads section. Neoncluster seems to have disappeared but I managed to take a copy a while before it went. Lots of games in there, unsure how many are MZ-80 compatible. Find it in the Miscellaneous part of my Downloads section. 29/07/18 — Books / Mags — I recently found a full copy of one of the Kuma software catalogues. Please find it in the Miscellaneous part of the Books / Mags section of the site, near the bottom of the page. 25/07/18 — Programming — I have just uploaded a copy of the WICS interpreter and its compiler to my Downloads section (under the Programming folder). I have very little information about this language at the moment but hoping to gather more information soon. 22/07/18 — Downloads — I have made a significant upload to the Downloads section of the site. There’s too much to list in one News entry. Two games and education library cassettes full of programs which were made by Knights have been uploaded to the “Games -> BASIC” section under their own folder. Some of those games and a variety of others recently discovered have been added to the main BASIC games section too. Also, in the Programming section I have uploaded the entirety of the Knights Wee Pascal tape. Also, we now finally have a copy of Haunted House (the BASIC adventure game) which a number of us in the MZ community have for ages been looking for. Both the MZ-80K and MZ-80A versions are in the BASIC games download section. I am also no longer carrying WAV versions of software in my Downloads section. I don’t see the point, most people are using the MZF files with emulators and if you need to convert to WAV for use on a real machine then it’s very simple with MZF Studio. 10/07/18 — Games — As a start to the upload of fresh new (old) games, I have just uploaded a Japanese game called The Pulser to the MZ-1200 folder of my Downloads section. I don’t think this game has been seen outside of Japan before. 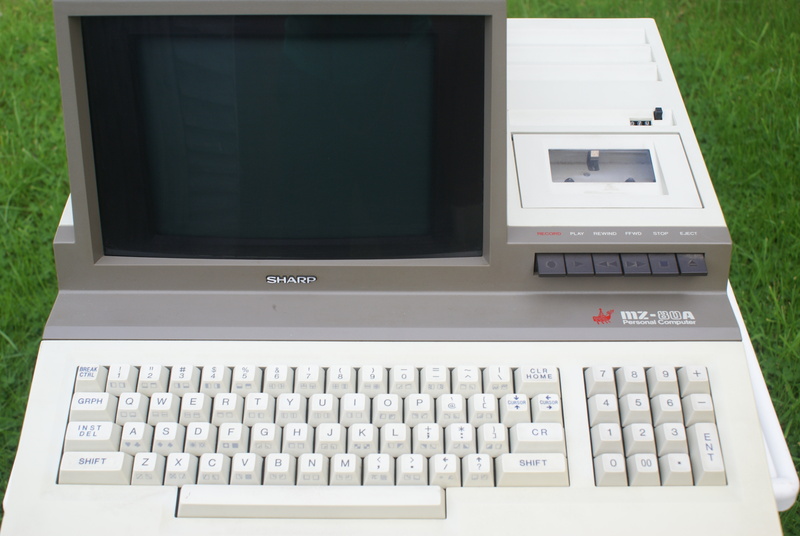 It is described as working on the MZ-1200 and MZ-700. I have tried on the 80A but couldn’t get it to work yet. However it did work on the 700. You have to load the main game “The Pulser.mzf” first before then loading the data tape. Instructions are on the attract screen. 22/02/18 — Downloads — I have recently finished typing in all of the games listings from the original books by Usborne (Computer Space Games, Computer Battle Games, etc). You can find these BASIC programs in the Downloads section under the new ‘Usborne Books’ folder. In the near future I will type in the much larger listings in the adventure games series. 15/02/18 — Downloads — I uncovered some more tapes recently that I hadn’t archived anywhere. Now in the Downloads section I have a new Miscellaneous section containing some Database and Accounts software created by Dean Software in the early ’80s. I also have a disk by Dean Software also which I haven’t transferred yet. I also managed to find another Forth programming language, this time by Sharpsoft which is available now in the Programming section of Downloads. 07/02/18 — Downloads — I recently acquired some MZ-1200 tapes. I have re-arranged the Downloads section to distinguish between MZ-80A and MZ-1200 software. The two machines are quite compatible except for their character ROM and memory size (I believe the MZ-1200 was maximum 32K). I will be working soon to port these MZ-1200 games to the MZ-80A (otherwise the graphics are all wrong due to different CG-ROM). 25/01/18 — Site — A new Sharp MZ discussion forum has been opened by the new owners of the sharpmz.org website. You can get to it using the ‘Forum’ link on my menu above. 15/12/17 — Site — I have moved the Downloads section to Google Drive now as this seems to work better than the OneDrive system I was using before. Please click the Downloads link on the menu bar above to try it out. 08/12/17 — Magazines — OK. All the broken links to magazines are now fixed! Apologies for having not noticed this for some time. 08/12/17 — Magazines — Have noticed that some of the magazine links were broken and re-directing straight to Your Computer Magazine no matter which magazine you clicked on. Mostly these have been fixed now but there is still some ongoing work to correct this. I will put another note here when this is all fixed. 05/08/17 — Site — I’ve rearranged some of the menus for the site so that the overall design is simpler. There is a separate menu just for Downloads now and all of the different types of programs (games, languages, utilities etc) are available from just one link now. The Homebrew section will be improved next. 28/07/17 — Downloads — I have begun tidying up the website and have already made a change to the Downloads section in that now there is just one link to the complete set of downloads. From there you can find games, programming and utilities and the games are simply organised only into BASIC and Machine Code folders rather than letters of the alphabet. I have also managed to get hold of a copy of Apollo Word (the word processing package), this is up now in the Utilities folder under Downloads. I hope to find a manual for it too at some point! 26/07/17 — Links — Have updated the links section to include a link to the amazing EmuZ-80A. If you want to emulate the MZ-80A on a modern PC then this is the best emulator available. It includes support for vertical blanking, Z80 interrupts and disk drives. Also it emulates the sound of the MZ-80A quite realistically. 24/07/17 — Site — I am working on the website and you will gradually notice changes over the next week or two. I’m trying to tidy it up and make it a bit more condensed. There’s a lot of information on here and it’s hard to know how to present it efficiently but I am working to create less menus and have it easier to find what you need. 22/07/17 — Books — Have finally managed to get a copy of the book “Starting Machine Code On Your Sharp”. This has now been scanned in for the website and can be found in the Books section towards the bottom of the page. 17/07/17 — Games — Three new games have been uploaded to the games section. Recently recovered from old cassettes, these are Aliens, Life and Siege. Obviously these are also available to download from the usual place. 15/07/17 — Manual — I recently got hold of a copy of the manual for SA-6510 disk BASIC. I don’t think these are particularly common and have scanned it in and uploaded to the site. Please find it here. 29/04/17 — MZ File Copying — New upload! I have now uploaded a copy of the SUC’s SuperTape 3 along with a manual for it. This is a very useful utility for copying MZ software. Please find it here. 08/03/17 — Programming — Uploaded a copy of Sharpsoft’s “Speed Basic” which I’ve had on tape for a while. I think it’s only for the MZ-80K though and don’t have any further information just yet. Hopefully I should have some more information soon. For now you can find it for download in the Programming Downloads section. 17/02/17 — News — Apologies for the lack of updates recently. We have been hard at work on new homebrew software titles for the MZ-80A so the website is taking a ‘back seat’ for now. More news soon! 09/01/17 — Homebrew — The unregistered version of Minesnake has also been added to the games downloads section here. 12/12/16 — Homebrew — Please find some new information about our first homebrew release here coming very soon on our brand new Sharpworks homebrew label for the MZ-80A. 07/12/16 — Homebrew — Great news : We should be able to announce our very first homebrew release this month!! This will be a main game plus a couple of other bonus games included with it. More news very soon. 13/11/16 — Homebrew — As I can see that the Homebrew section of the site is becoming quite popular and it was fairly static up to now, I have decided to make a separate ‘news’ page specifically for the Homebrew section and will keep this up-to-date so that it is more obvious that we are working on things. Find the updated page here. 29/10/16 — Games — I’ve uploaded a fantastic new game to the site today, this took some time to get together as it had to be typed in from the original magazine (Computing Today April 1982). I’ve ensured it is fully converted correctly to the MZ-80A. It is called The Valley. You can find the video of it here and the MZF/WAV is already available in the Downloads section. Please also see Fraser Charlton’s brilliant site for complete documentation on this game. 12/10/16 — Programming — 2nd update for today. There seemed to be a problem with the screenshot on the Interrupts programming page so I have filmed the interrupt running instead and have posted the new video up here in the programming section. 12/10/16 — Games — Spillhistorie.no author Joachim Froholt has typed in one of the example programs from the Peeking and Pokeing the MZ-80A book. There wasn’t a name for it, so he’s named it “Aliens”. You can find it here. As usual, any games are available from the Downloads section. 06/10/16 — Games — Two further games just uploaded to the Games section, Cyborg and Repairman’s Revenge (which happens to be the sequel to Short Circuit which I uploaded a little while ago). Find them both in the Games section. 01/10/16 — Games — Another game uploaded to the site, similar to the last one this one is a type-in listing from C+VG magazine. It’s called Assault. Please find it here. 28/09/16 — Games — New game uploaded to the Games section called Short Circuit. 22/09/16 — Games — Got hold of a copy of “Tombs of Karnak” by Solo Software recently. Please find a video of it here and the game itself is now available also for download here. 13/09/16 — Books — Managed to get a full copy of Digital Research’s “CP/M for the MZ-80A”. Please find the manual here. 09/09/16 — Games — Uploaded a new game, Master Checkers (published by Kuma), to the website. It is available in the Games Downloads section and you can find the video here. 08/09/16 — Newsletter — Managed to get hold of Issue 17 of Sharpsoft’s user notes. Just uploaded this here. 05/09/16 — Games — Three excellent new games uploaded to the Games section in Bomberman (Hudson Soft), Electron 22622 (Kuma) and Raid (Sharpsoft). 04/09/16 — Utilities — I now have a copy of David Computer Software’s “DCS Converter”. This is a very good alternative to the SUC Converter which I already had on the site. It will convert BASIC programs written for the MZ-80K to the MZ-80A (and MZ-700). Please find it here. 30/08/16 — Games — I am very pleased to announce that, with the permission of the original author Takaya Arita we can now host the original copy of his 1980 game Cavern 2160. Please find it here in the videos section and here for the download. Many thanks to Joachim Froholt of Spillhistorie.no for typing in and converting this game from its original MZ-80K listing to the MZ-80A and then also providing a compiled version. Please also see the recent remake for Steam by Mikito Ichikawa here. 28/08/16 — Website — The games downloads section has been improved, machine code and BASIC games are now seperated into separate folders. See here and click the different sections (e.g. A to F or G to L etc) to see the change. 27/08/16 — Games — Three new game uploads. These are actually MZ-80K games I found recently. I have converted them to run on the MZ-80A. The games are Fireballs, Monkey Climb and Snakes & Ladders. Hopefully I will also upload the MZ-80K original files soon too. Please find them here. 17/08/16 — Homebrew — Announced today the start of our software label : Sharpworks. More information to be found here. 15/08/16 — Website — All downloadable MZF / WAV files have now been transferred to the new hosting at Onedrive. This works far better than the old Mediafire account did. 12/08/16 — Website — I’m slowly migrating all of my downloads from Mediafire to Onedrive as Mediafire just seems to produce blank pages most of the time when clicking links. Have so far moved the Games over. The Programming MZFs / WAVs will take a bit longer as there are a lot of individual download links on the downloads page. 10/08/16 — Manual — Have uploaded a copy of the MZ-80A Service Manual, available here. 08/08/16 — Manual — I only just noticed that the first real page of instructions in the PA-MON manual was corrupted, thereby excluding the first command (MODIFY). I’ve fixed this now and the corrected PDF manual can be found here. 01/08/16 — Software — I have managed to get hold of the original Software Pack which was bundled with the MZ-80A when originally purchased. Please find scans of the pack and full downloads of all software here. 27/07/16 — Magazine — Recently I came across a software catalogue published by Sharp, probably from before the MZ-80A was around (it seems to be geared towards the MZ-80K, particularly when you take into account the note written by somebody on the front), which gives a good idea of the number of software companies who existed at the time and number of packages. Please find a scan of it here. 23/07/16 — Manual — I’ve now found a copy of Sharpsoft’s excellent machine code monitor and disassembler program PA-MON. I’ve got the software and the manual up on my downloads page. 17/07/16 — Manual — Just uploaded the ‘manual’ (or rather as much documentation as I could find) for the SA-5510 Compiler which is about the best compiler for BASIC programs. You can find the manual on the download page here. 17/06/16 — Manual — The SUC has also now donated the full ASM listing of the ZEN assembler, again find it here. 13/06/16 — Manual — Very generously, the Sharp Users Club have provided a much better copy of the Zen Assembler manual than I previously had on this site (the previous scanned version I had here was very difficult to read). The SUC has also provided an interesting manual for the CP/M version of Zen. Find it all here. 04/06/16 — Manual — Now uploaded documentation for the Converter utility (which converts between different versions of BASICs) and the DISASM disassembler utility. Find them both here. 02/06/16 — Manual — Uploaded some documentation, this time for the different Super BASICs (SA-5575 & SA-5577) and for the Hippo Associates 80-column BASIC (SA-5580). Find them all here. 31/05/16 — Manual — Uploaded documentation for the BAS MOD utility which extends the command set of Sharp BASIC. Again, please find this new upload in the Downloads section. 30/05/16 — Manual — Have uploaded manuals for SP-4015 Pascal and B880 Master / B880.A3_P6 disassembler. Please see Downloads section. 29/05/16 — Manual — I’ve noticed some people are searching for manuals or instructions for various programming languages (for instance SP-4015 Pascal) and utilities. I do have some information which I can upload from historical Sharp Users Club magazines which should help. Look out for these in the next few days on this site. 10/05/16 — Programming — Have managed to get hold of an original copy of Kuma’s FORTH language tape for the MZ-80K. I’ve tested it on my MZ-80A and it works fine so have uploaded it as an MZF and WAV to the Programming Downloads section. 08/05/16 — Magazines — A new category for ‘Miscellaneous’ magazines added to the site. So far, one magazine found relating to the MZ. Please find it here. If I find other random magazines with one-off MZ-related articles they will be uploaded to this section. 03/05/16 — Manual — This is just a short note to state that I will soon be getting a much better copy of the ZEN Assembler manual to put up on the site, so for those who have already downloaded the poor copy (the only copy I could find anywhere at the time) then you’ll probably want to re-download when it’s up. Will write another News post here once it’s available. 30/04/16 — Magazines — Uploaded relevant pages from all copies of Practical Computing magazine that I can find from 1981. Please find it all here. 24/04/16 — Programming — Created a new page covering the BASIC Tutorial cassette that came with the MZ-80A. Please see the page here to see four videos covering each tutorial. 22/04/16 — Magazines — Beginning to upload some scans of the Practical Computing magazine from the early ’80s. The magazine often featured some Sharp MZ related items. Only a couple of issues up there so far but will be putting the rest up over the next few days (of the 1981 issues anyway, still need to get hold of the 1982 ones). 19/04/16 — Games — Major update to the Games Videos section of the site. The pages were beginning to become overloaded with embedded Youtube videos and as a consequence were starting to take ages to display. All videos now changed to screenshots which you can click on to be taken to the relevant Youtube video. 17/04/16 — Games — Two new games uploaded to the Games section : Alien Attack (not the BASIC game of the same name) and Escape Force. 14/04/16 — Games — New game UFO Caves uploaded to the games pages here. 13/04/16 — Games — Found a copy of Canyon Raider on tape recently and wondered where it came from. This led to the discovery of a C & VG magazine type-in listing that I don’t have on my site. I have just uploaded the listing here. Hope to upload the tape copy as an MZF & WAV file very soon along with a video of the game. 10/04/16 — Games — Four new game videos have been uploaded. These are for Apollo Chess, Diamond, Minotaur and Sargon Chess. See the games section. 05/02/16 — Links — Added a link to Torsten Crass’ website which details how to repair your MZ-80A, including how to repair the keyboard. Find it on the Links page. 10/11/15 — Games — Uploaded seven new game videos (also as MZF/WAV downloads as usual) : Noughts + Crosses, Numbercrunch, Pinball, Ski Run, Space Combat, Spooks, The Lily Pond. 04/11/15 — Programming — Uploaded a copy of my BASIC interrupt programming routine. This will not work in emulators, only on a real MZ-80A. Please find it in this folder. Also finally uploaded a copy of COSMIAD to the games downloads section, both the original MZ-80K and the converted MZ-80A versions are available. 14/10/15 — Games — Some more game videos uploaded. Cosmiad, (another!) Defender, Forest of Doom, Munchers and Wiggly Worm. Note : Cosmiad not yet up for download from the site as having trouble converting the original tape to a readable WAV (readable by MZFStudio). Am working on this! 01/10/15 — Programming — Made sure there is now a link on the Programming Downloads section to the complete folder of downloads so you don’t have to keep clicking all the ones you want to download, you can now zip the whole folder and download it. 20/09/15 — Games — Major update to the Games section. Instead of individual links above each game video to download the MZF and WAV files (making it rather annoying to just grab the lot) I have decided to just give access to the folders where all the files are stored. Now you can ZIP a whole folder via Mediafire’s interface and grab it all in one go. Have also uploaded ten new videos to the Games section, these are : Air Lander, Alien Attack, Blocking, Defender (the BASIC version), Digger, Dog and Flea, Dog Star Adventure, Flying Mission, Ludo and Mad Max. 13/09/15 — Games — Uploaded three Kuma adventure games. Kindly donated to the site by The Museum of Computer Adventure Game History. These are The Adventure Game, Cursed Chambers and Quest. 11/09/15 — Programming — Uploaded the MZ-80K’s BASIC interpreter to the download section, this will run some MZ-80K specific programs on an 80A. Also uploaded the excellent Converter utility also to the programming downloads section, this allows you to convert 80K programs to 80A (converting between different types of BASIC). Currently going through a huge haul of MZ tapes I got hold of recently, lots of games and stuff (some unpublished homebrew no doubt but still very interesting). There will be many more uploads to the site soon. 05/09/15 — Games — Uploaded one more game video to the Games page. Tunnel Run. 26/08/15 — Website — Major tidy-up to the ‘orphaned’ pages that existed in the site’s menus. (For instance clicking on Games rather than its sub-menus or clicking on Magazines instead of its sub-menus would take you to a ‘placeholder’ page). This is looking much better now, all graphics on the page taken as screenshots from a real MZ-80A. 17/08/15 — Website — Created separate news menu for the site as the site news was getting hidden away in archives! 04/08/15 — Games — Added a ‘publisher’ field in the Games section of the website as some of the new games I will be uploading in the next few days have both an author credit and a publisher credit. Look out for a lot more games coming to the Games section in the next few days. 26/07/15 — Games — Uploaded five new videos to the ‘Games’ section of the website. May have to re-record a video of Space Invader as it is quite blurred. Plenty more games to come. 24/07/15 — Programming — Uploaded MZF & WAV files to the ‘Programming’ section of the site including various versions of BASIC, a PASCAL version and plenty of Assemblers / Disassemblers (inluding the excellent Zen). All under a new ‘Downloads’ menu item (sub menu of Programming). 21/07/15 — Games — Spending this week taking some trial videos of games for the website, hopefully to be uploaded to the site this week if they come out good enough. 27/06/15 — Newsletter — Uploaded issue 7 of Sharpsoft newsletters and created the links page with some links to other MZ related sites.